When war in Europe broke out in 1914, the Ottoman Empire, pursuant to secret protocols, agreed to provide shelter to the fleeing German Battleship, Goeben, which was renamed, Yavuz. After Britain refused to deliver newly ordered Turkish battleships, the Turko-German fleet bombarded Russian forts, signalling the Ottoman Empire's entrance into World War One. 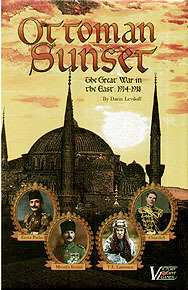 Ottoman Sunset is a stand-alone solitaire State of Siege TM game on World War One in the Near East from 1914-1918. The player controls the Young Turks (Committee of Union and Progress) as they try to keep the Ottoman Empire alive amidst the struggles of the Great War. 57 two-sided, multi-shaped, laser-cut counters.